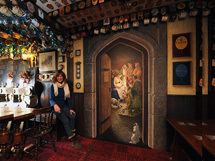 "I have been painting all my life and now find that I have become an expert in the field of ‘trompe l’oeil’ painting and murals – in other words the field of ‘wall art’." Trompe L’Oeil, pronounced ‘tromp loy’, means ‘trick the eye’ in French and refers to the particular style of painting whereby the artist creates an illusion of space and paints an apparently three dimensional image on the wall within the context of the surrounding architecture. 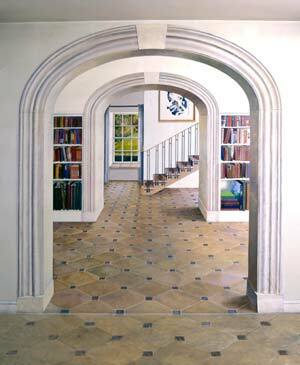 Trompe l’oeil painting is not new! Although the Greeks invented it, it was the Romans who developed it to enhance their living spaces, making private homes appear grander and more spacious with the use of extraordinary theatrical illusions to adorn bare walls. We are fortunate that so many of these early wall paintings have been preserved all over the world – in tombs, religious buildings and even some of those early homes. Trompe l’oeil distinguishes itself from ordinary decorative painting by its intent to deceive, and it is this which sets it apart from ordinary still-life painting. The artists technical ability is meant to go undetected and, with use of perfect perspective, cleverly observed light and realistic colours, the ‘trick’ is to make the onlooker believe that a flat surface is not flat, or that a space exists where there is no space. A trompe l’oeil painting is one which shows apparently three dimensional objects and spaces in a way which the eye accepts as realism in the context of their surroundings. Although trompe l’oeil is a visual joke, the joke is only effective if you do it really well..... and achieving ever greater personal understanding of realism in painting is what motivates me to keep trying more complex and interesting paintings! How did I come to be doing it? It was like this: I came from an artistic family and always painted as a child. Later I chose fine art/painting as my main study at Kingston Art School, now Kingston University. Kingston was famous for its fashion department and, influenced by a fellow student, I got somehow caught up in the world of media, beauty, fashion and advertising and became a photographic model, working in London, New York, Paris and Hamburg. I never abandoned my ambitions to become a serious painter and always travelled with a sketchbook and paints, coming back to London and spending time when not working producing large oil paintings and occasionally selling them. I even had a couple of shows in London. My modelling career led me into TV commercial production and faced with such enormous creative possibilities, my artistic side began to flourish and I started to work on the other side of the camera, first as a ‘stylist’ (someone who seeks props), then a set dresser, an art department assistant, an assistant art director, an art director and then, the most significant development, a scenic artist. Painting scenery was like a dream come true for me and I found that I was really good at it! It was well-paid and over a period of several years I worked in all the main film studios around London – Pinewood, Shepperton, Elstree, Twickenham etc. I worked on countless TV commercials, advertising campaigns and a few feature films, including the Pink Floyd film, The Wall. 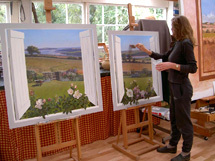 My ability to visualise realism and paint landscapes and skies on a large scale stood me in good stead and although the field of scenery painting was mainly male orientated, I was soon in great demand and loving the work! By chance I visited Cornwall for a weekend in 1978 during the filming of Frank Langella’s ‘Dracula’ and was completely unprepared for the astonishing beauty of the Cornish landscape. 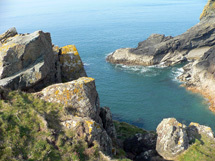 I felt I had discovered a place which truly suited me and I made Cornwall my home. 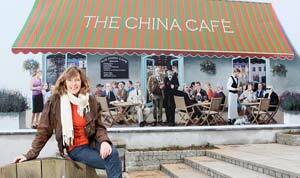 Finding myself in need of a secure income if I wanted to survive in the West Country, I set off to the Television South-West studios in Plymouth where I introduced myself to the production designer as a competent scenic artist. For several years I worked at the TSW studios for months at a time, travelling to and from London as well and continuing to paint scenery in the London Studios. Juggling a family life, small children, dogs and work was exhausting and often overwhelming. For years since that time, I have listened attentively when the difficulties of being a single parent crop up in debates or discussions on the radio or television. No one knows better than I do how hard life can get when you are the only breadwinner and have tiny children depending on you! 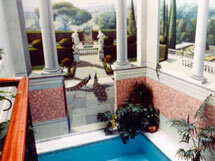 In 1983 I was asked to decorate the walls of a swimming pool in Hyde Park Square and my mural painting career began! Since that first mural, I have painted walls in hotels, airports, railway stations, restaurants, cinemas, stately homes, private houses, public spaces and even some temples! 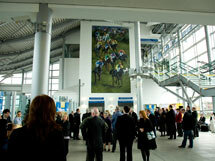 I now concentrate on figurative painting – both in murals and in my own paintings on canvas. 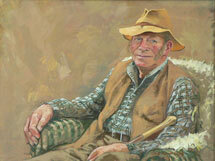 In the last few months I have concentrated on what I love doing most: painting portraits. This is really a spin-off from my murals as it has become routine for me to include life-size portraits of clients and their relatives in many of the commissions. My clients include the very wealthy, famous and chic, councils, hotel chains, religious people, creative people and all kinds of modest people in between who just want something a bit different! I think the strength of my work lies in the preparation of a strong design, attention to detail, colour and perspective. On this subject, with the help of members of my family who are architects, I have written a user-friendly book especially for artists. It is called The Artists Guide to Perspective and is published by New Holland. My first book – a practical guide to mural painting - is called The Art of Illusion (also known as Janet Shearer’s Trompe L’Oeil Painting Course). This book, published in three languages, sold over fifty thousand copies. Sadly it is no longer in print but can be found in most libraries. 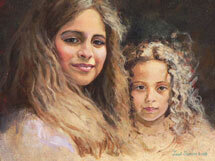 I plan to re-launch the book one day soon with additional new step-by-step painting projects. To commission a painting, please contact me at janetshearer@trompeloeil.co.uk or phone 01208 831926 to discuss your thoughts at the earliest stage. I will help you develop your ideas into a workable design with careful attention to practical matters and lighting, your budget and your timescale. I work a lot off-site, painting canvasses which can be fixed later in situ or working on the original artwork to scale for reproduction by a team of print experts so that larger work can be applied to enormous spaces easily and without the unnecessary prolonged presence of scaffolding and mess. This system has the additional advantage of easily being replicated if damage occurs, reducing maintenance costs for exterior murals. This website will show you a selection of murals and paintings: equestrian art (or horse art), portraits, landscapes and still life. 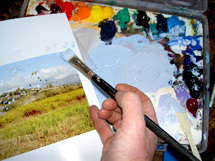 There are also some pictures of painting tuition going on in the studio and around the farm.